Changes in consumer behavior have impacted both sales and marketing in positive and negative ways. 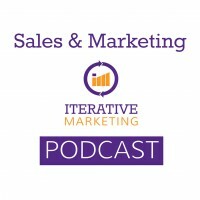 This podcast explores how sales and marketing must adapt to meet the demands of this new consumer behavior — and gain a new appreciation for each department’s role in the organization. Consumers interact with sales much later in buyer’s journey as one of the last touch points. Internet provides greater access of information to buyer to do own research. Learn about marketing’s Zero and First Moments of Truth. Globalization and virtualization levels the playing field between industries. Example: 99Designs’ impact on graphic designers. Expectation of personalized service changes how we interact with products. Consumer tolerance for irrelevant messages is dropping and is a brand turn-off. Consumers used to reach out in Think state, but now waiting until Do state. Study: Buyers do not contact suppliers directly until 57% of purchase process is complete. Consumer feels in “driver’s seat” when reaching out to sales and is armed with information and possibly talking to other vendors. Needs to bridge the gap with sales as an overlap, not a hand-off.